NOTA: A miracle of our time! Select Your Language: ENGLISH (Notaland) | 日本語 and more.. Tried to create their own websites in vain. Successfully created their own websites but gave them up half way because they were sick and tired of updating their sites too frequently. No.1: First display the NOTA's unique blank screen. No.2: Write something or paste photos or pictures there. No.3: Believe it or not, your website is already there! No need to save or upload files. You don't even need your own PC! "Don't fool me! You cannot say you have your own website unless you have uploaded your files to the server." Wrong! Do not underestimate its ability. With NOTA, you are completely free from those complicated and troublesome tasks! Your website is already displayed in cyberspace and everybody is watching it with all smiles before you know. Before NOTA, we had to update our Web pages all the time to make some corrections or add something to them, which has been an extreme burden for ordinary people. To update you had to activate a Web page maker and modify your files on your PC and upload them to the server--no easy task for average users along with more difficult ones like redesigning the page or creating a new page by linking it to one another. Now enter NOTA and you are perfectly free from those nasty routines such as modifying documents, pasting photos, changing their size or location, deleting unnecessary parts or pages, you name it, without consulting documentation. On top of all that, all the modified pages are displayed instantly on the Web for everyone to see them without bothering to save them . You can do all your assignments even with someone else's PC while you are viewing them on the screen. 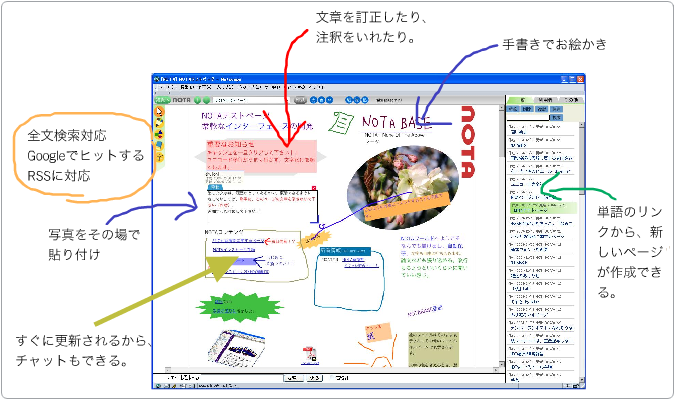 Working on a document on a NOTA screen is sometimes easier than doing it using Word processors. No knowledge is required about HTML. You can change the size or color of letters, or select the color of the background with ease. You can display your hand written letters on the screen too. You can also make your Web pages cool and colorful by putting some shapes (vector graphics) with beautiful colors. It is one thing you cannot do with conventional Web makers to create or move shapes wherever you want to. NOTA's revolutionary breakthrough does not stop there. You can receive impressions or opinions from viewers in real time. Traditionally emails or message boards have been used to get reactions from readers of websites. However, apart from top websites, is it not true that they have seldom been used, far less frequently than you have expected or even hoped? One of the reasons for this must be that it is simply troublesome to send emails to you, or message boards, along with so many do's and don'ts, are so remote from the page they are working on that visitors lose interest or shrink from responding to you. It is not the case with NOTA. Anybody can leave messages or information on any place they want to if the creator or a person in charge of the website sets up the system to allow them to do so. Teachers, for example, can give corrections in red hand written letters to their students' writings. Have you ever floundered with such a situation that you, a member of a website run by your circle friends, cannot update the page since you are unable to get in touch with the person in charge; or you cannot find a successor to take over the caretaker now in charge who has been troubled with too much burden. NOTA has successfully given a basic solution to those problems by allowing each member of your circle to add comments on a page while they are browsing it. You can even have a chat with your friends while your Web pages have been updated in real time, a kind of miracle only NOTA can make possible. "Whoa, wait up man, but does it mean that some intruders might hack inot my website?" Please calm down. There is nothing to worry about. If you want it, you can freeze any page specifically so that nobody could change or ruin them. However, is it not true that most of our websites have been obsolete or cast away with no visitors at all? With most websites, especially shared by your club members or class reunion friends, you would be a lot better off with NOTA, easy to handle and free to leave a message, and you can expect much more visitors. Another great point about NOTA is you can create countless pages quickly, from home to sub page, sub to double sub endlessly. All you have to do is select a phrase from text on your home page, say,"self-introduction" and click "Create a new page." That's it! Now you have a new Web page titled "self-introduction," and you have its link on your home page at the same time. And then you have only to complete it later in your spare time.You do not have to go through complicated procedures when you add, delete, or modify any page of your website. You can produce new pages one after another out of the key page with the table of contents if you make use of NOTA's linking function. It is a piece of cake to create each website for each member of your circle from their name list on the home page by linking them with each other. To top it off, you can add or delete a member at your command later. There is no need for members to report to their caretaker to ask "Would you upload my updated files?" or "Delete these outdated files, would you?" Any of which would be impossible if not for NOTA that is capable of browsing and editing files at the same time. You can also print Web pages with NOTA. Probably you have been at a loss more than several times when you have failed to print landscape documents with the rightmost part missing while using Internet Explorer or whatever. With NOTA, however, the whole screen is neatly divided into A4-size pages, so you can print each document exactly in the same way as they are displayed on the screen without fail. How far will NOTA go? With a lot of remarkable features NOTA has, you will be able to come up with plenty of unique ideas to use it. How about these? Bring a notebook PC into the sports stadium and send a live report about what is going on in the game in real time, uploading digital camera photos of the game with a lot of "Hurray, way to go!" messages coming in. Students hand in their assignments by NOTA and the teacher grade them with comments and disclose the results. Writers put out their novel on their website created by NOTA and their friends living far away paste illustrations in any place they want to.